Did you know that there are only 85 days until Christmas? That's less than 3 months! Have you started thinking about your holiday shopping? Well, now is the perfect time to begin your holiday shopping by entering to win your gifts instead of having to purchase all of them this year! I was lucky enough to win two more great blog giveaways last week! One for a Diamond Candle and the other for a Battroborg robot which just happens to be one of the top toys on the Toys“R”Us Hot Holiday Toy List! 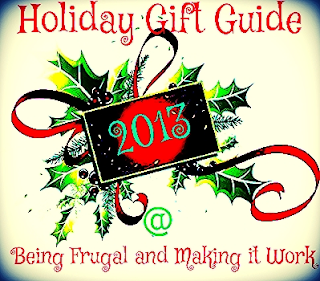 The second annual holiday gift guide is currently being put together right here at Being Frugal and Making it Work, and I plan on providing you with some fabulous holiday gift ideas, reviews and giveaways for everyone on your holiday gift list. My goal is to make it even bigger and better than last years holiday gift guide! We would love to be included in your holiday gift guide and participate in the giveaway.